That’s the question Jeff Goldblum asks himself throughout Into the Night. It was also the thought running through my head around 2 AM on a recent weeknight. I was going through a weird, mild bout of insomnia. Every night, I’d wake up at 2 AM and simply stare at the ceiling. As a pop culture obsessive, I naturally assumed the cure was to simply turn on the TV and flip through the channels in search of something to watch until I finally fell asleep. On one such night, I stumbled on the opening credits sequence of 1985’s Into the Night. I had no idea what the film was about or who was in it. I just knew I’d never heard the BB King song, the appropriately titled “Into the Night,” playing over the soundtrack as a car dashboard camera depicted the nocturnal happenings of mid-80s Los Angeles. His nighttime boredom leads him to aimlessly drive around town before making it to the parking garage of the Los Angeles airport’ where he briefly ponders a work friend’s (Dan Aykroyd) advice to take a quick flight to Las Vegas and cheat on his wife as revenge for the affair she’s having. As soon as he thinks better of it, a very young Michelle Pfeiffer (playing a character named Diane) suddenly jumps in the back of his car, sucking him into her flight from four very irate Iranians, one of whom is played the film’s director, John Landis. Another tagline: Ed Okin used to have trouble sleeping. Then, one night, he met Diana. Now, Ed’s having trouble staying alive. And that begins what Leighton Grist once described as the “yuppie nightmare cycle” sub-genre, a Reagan-era combination of screwball comedy with film noir. It always involves a white yuppie being pulled into a world unknown to them, usually a white male by a mysterious white female. Examples include Blue Velvet (1986), Something Wild (‘86) and the Bruce Willis/Kim Basinger comedy Blind Date (’87). In the case of Into the Night, it’s definitely a “wrong place at the wrong time” comedy. It takes place mostly over one very long night as Ed is drawn into a convoluted plot involving drug mules and wealthy Middle-Eastern princes. With Diane by his side, he encounters various facets of the LA nightlife, such as 24/7 diners, Elvis impersonators, nighttime shoots for Hollywood movies, and raging parties at glitzy hotels. David Bowie even shows up as a bizarrely menacing antagonist, and he’s just so delightfuly David Bowie about it all. Following the film every step of the way is BB King’s instantly recognizable guitar licks, punctuating the quieter moments and underscoring transitional scenes. In addition to performing the title song, BB King also performed “My Lucille” and “In the Midnight Hour” for the soundtrack, although all of the songs were composed by Ira Newborn. Sadly, BB King died yesterday, passing away peacefully in his sleep at the ripe old age of 89. He had been on a seemingly endless concert tour until falling ill during a show last October, subsequently canceling any remaining dates. But back in the 80s, King’s recording career had slowed down. At the time of Into the Night, he had not yet recorded “When Loves Comes to Town” with U2 and joined their Rattle & Hum tour. As such, his appearance on the Into the Night soundtrack was quite notable, and John Landis even made a 27-minute documentary about the recording process. The actual film probably dips into the well of having King sing the “Into the Night” chorus in-between scenes one too many times. However – and get ready for the segue – such an unrelenting march into night must have been how Landis felt at the time. He was still dealing with the legal fallout of the deaths of three actors on the 1982 set of Twilight Zone: The Movie. Vic Morrow and two child actors, aged 6 and 7, died when a helicopter stunt went very, very wrong. Landis was charged with manslaughter, but the only guilt he acknowledged was knowingly hiring the child actors in violation of California law which prohibited them from working at night or in proximity to explosions. He was acquitted of all charges, but not until 1987. As such, in 1985 making a film about a man suffering through insomnia and plunging headlong into an endless, increasingly hostile night, seemed to mirror Landis’ own state of mind, a reflection of his dark night of the soul. That’s not to suggest Into the Night is a deadly serious movie. It’s actually supposed to be taken as a black comedy even though it’s never particularly amusing, earning a smirk or slight chuckle in its best moments, such as an ocean-side killing in which the murderers prefer to first take off their shoes due to all the sand. There is, unfortunately, an alarming amount of casual racism directed at the Middle-Eastern characters, although this was also the same year of Doc Brown fighting off the Libyans in Back to the Future. So, yay 1985. Goldblum, mostly playing the straight man, and Pfeiffer, a delightful screw-up, deliver performances which are probably better than the actual film, with Goldblum doing the sleep-deprived deadpan thing nearly a decade before David Duchovny made it his defining characteristic with The X-Files. You could argue Into the Night is actually part of an even smaller subset of the yuppie nightmare cycle of films: the long, crazy night in hell. There’s Blind Date, and there’s also Martin Scorsese’s After Hours (1985). Similar to Landis, Scorsese was coming off considerable professional strife. Last Temptation of Christ, his controversial passion project which eventually got made in 1988, had been canceled by Warner Bros. in 1983 due to budget concerns. He’d spent a year prepping it. Now, it was dead. After Hours, based on a screenplay written by a 26-year-old film student, was his attempt to keep busy and working while trying to find a new home for Last Temptation. Like Into the Night, it depicts a meek white guy with a boring job who impulsively travels to a different area of town where he meets a beguiling young woman as the precursor for a night he can’t get out of. In this case, Griffin Dunne plays a word processor – yes, that was a job then – who travels to Manhattan’s Soho District where he hits it off with the gorgeous, but clearly unbalanced Marcy (Rosanna Arquette). After their coffee shop encounter, he calls her from his home to set up a date and rushes back to Soho to meet her. There, he meets her Bohemian artist roommate (Linda Fiorentino), who puts him to work on her person-shaped paper mache model in the center of the loft. Once Marcy arrives, something is clearly off about her, running hot one minute, cold the next, leading Dunne to work through in his head just how much work he wants to put into his chances for a one-night stand. He makes up an excuse and hightails it out of there. However, he has no money to pay train fare home. Every woman he meets seems to be into him before turning on him. And eventually, a vigilante mob wants him dead, blaming him for the neighborhood thefts perpetrated by the cameoing Cheech & Chong (Oddly, Into the Night also has cameos, in the form of countless notable LA filmmakers of the era). Scorsese’s nocturnal Soho is a place where good intentions go to die, comically exasperating Dunne along the way, putting our white collar hero into continual conflict with various blue-collar workers (like John Heard’s bartender, Teri Garr’s waitress, or Catherine O’Hara’s ice cream vendor) and artists (Linda Fiorentino’s sexually aggressive conceptual artist). By contrast, Landis’ nighttime LA is a place of constant motion, glitz, glamor and broadly sketched cartoon-like characters. His version of class conflict is watching Goldblum trade up from white collar living to wandering around Hollywood mansions and acting as a go-between for warring factions of a mob whose goals end up being oh so mundane and practical. Goldblum’s insomnia-related concerns rob him of any ability to truly react to the bizarreness of it all. He’s just too tired to register much of a surprise whereas Dunne’s “I know this is going to sound crazy, but…” explanations and related descent into frustrated madness are quite often hilarious. 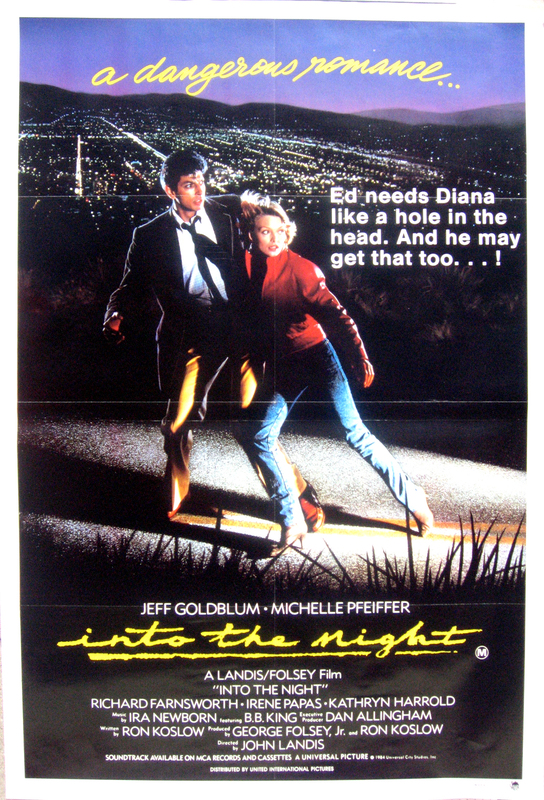 Of course, Into the Night is more or less a screwball comedy about a mismatched pair falling in love while enduring extreme circumstances, making it the more traditional narrative, while After Hours is about a yuppie who heads to Soho to get laid but instead gets chased by an angry mob. The differing tones of the two films perfectly reflect the differing sensibilities of their directors. John Landis looked at nocturnal Los Angeles as a potentially perilous, but also undeniably exciting place of adventure while the latter gazed at New York and saw imminent danger and deadly misunderstandings. After Hours is probably the better movie on a technical and plot construction level, but Into the Night is ultimately the one I enjoyed more. After all, it’s not every day you turn on a random old movie that begins with an opening line that seems to speak directly to your situation. Thankfully, my insomnia has passed. Sadly, it did not lead me into a wacky adventure in which I got the girl, fought the mob, and met David Bowie. I’m the poorer for it. Thanks. It’s not the normal comic book related type of thing I write about. So, I am glad you dug it. I randomly encountered these two movies within days of each other a couple of months ago and had been thinking about writing about them ever since. Sadly, it was BB King’s death that finally kicked me into action. If I had to choose between the two, I would watch Into The Night just because BB King is all over the soundtrack, the entire film is just so weird, and it interesting seeing young Goldblum and Pfeiffer. However, if none of that holds sway then after hours is the obvious choice because it is the much better film. After watching both I have to say Into the Night is my favourite of the two, maybe I’m just a sucker for traditional narrative as well! After Hours was intriguing but I found Dunne’s exasperation exhausting, the bizarre circumstances too ludicrous to fathom and the loft scenes a little too surreal for my liking, almost like a bad trip. I suppose in that sense, technically After Hours is better but I still prefer watching a young sleep deprived Goldblum bumble around L.A. Probably most importantly, I simply liked Goldblum better than Dunne. We are actually made sympathetic toward him (finds out wife is cheating on him, he decides against going to Vegas to have his own affair, has some sense of being a good Samaritan to pfeiffer) whereas Dunne is really just a dude trying to get laid. So, Into the Night ends up being the more enjoyable viewing experience, perhaps also because, as you pointed out, Dunne ‘ s exasperation in After Hours might in fact wear a bit thin after a while whereas Goldblum is too sleep deprived to ever register an annoying tone. Previous Entry Arrow’s “My Name Is Oliver Queen” (S3,EP23): Sticking the Landing? Next Entry How Can You Not Like Mad Men?